Galectin-3 is a 32 kDa protein secreted by macrophages involved in processes such as cell activation, chemotaxis and phagocytosis. Galectin-3 has previously been shown to improve the ability of airway macrophages to ingest apoptotic cells (efferocytosis) in chronic obstructive pulmonary disease (COPD) and may be of interest in non-eosinophilic asthma (NEA) which is also characterised by impaired efferocytosis. It was hypothesised that the addition of exogenous galectin-3 to monocyte-derived macrophages (MDMs) derived from donors with NEA would enhance their ability to engulf apoptotic granulocytes. Eligible non-smoking adults with asthma (n = 19), including 7 with NEA and healthy controls (n = 10) underwent a clinical assessment, venepuncture and sputum induction. MDMs were co-cultured with apoptotic granulocytes isolated from healthy donors with or without exogenous recombinant galectin-3 (50 μg/mL) and efferocytosis was assessed by flow cytometry. Galectin-3 expression and localisation in MDMs was visualised by immunofluorescence staining and fluorescence microscopy. Galectin-3, interleukin (IL)-6 and CXCL8 secretion were measured in cell culture supernatants by ELISA and cytometric bead array. Baseline efferocytosis (mean (±standard deviation)) was lower in participants with asthma (33.2 (±17.7)%) compared with healthy controls (45.3 (±15.9)%; p = 0.081). Efferocytosis did not differ between the participants with eosinophilic asthma (EA) (31.4 (±19.2)%) and NEA (28.7 (±21.5)%; p = 0.748). 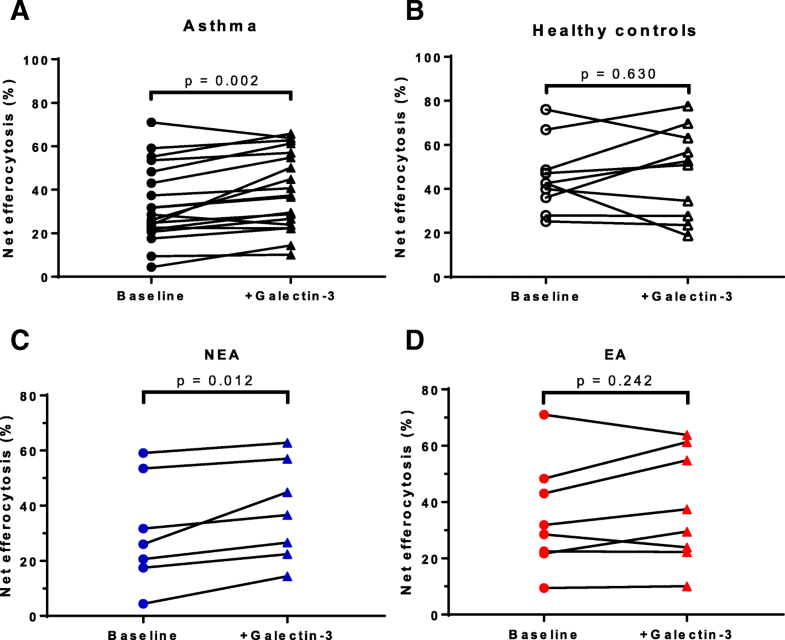 Addition of galectin-3 significantly improved efferocytosis in asthma, particularly in NEA (37.8 (±18.1)%) compared with baseline (30.4 (±19.7)%; p = 0.012). 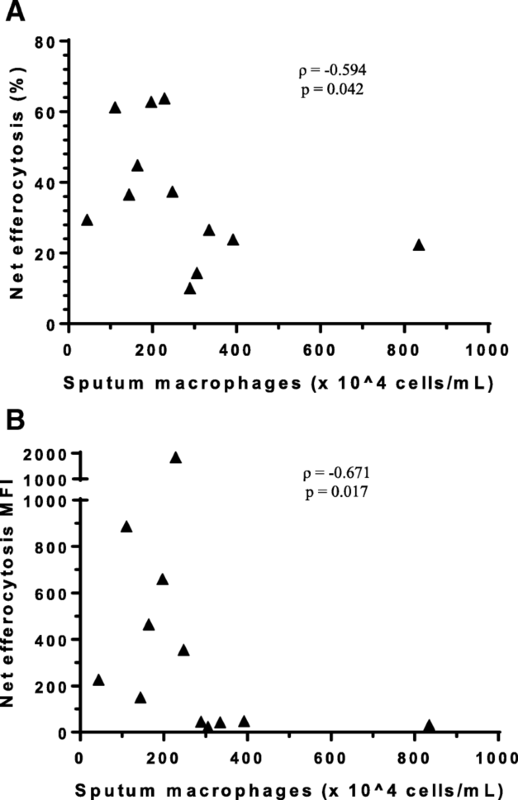 Efferocytosis was not associated with any of the clinical outcomes but was negatively correlated with sputum macrophage numbers (Spearman r = − 0.671; p = 0.017). Galectin-3 was diffusely distributed in most MDMs but formed punctate structures in 5% of MDMs. MDM galectin-3 secretion was lower in asthma (9.99 (2.67, 15.48) ng/mL) compared with the healthy controls (20.72 (11.28, 27.89) ng/mL; p = 0.044) while IL-6 and CXCL8 levels were similar. 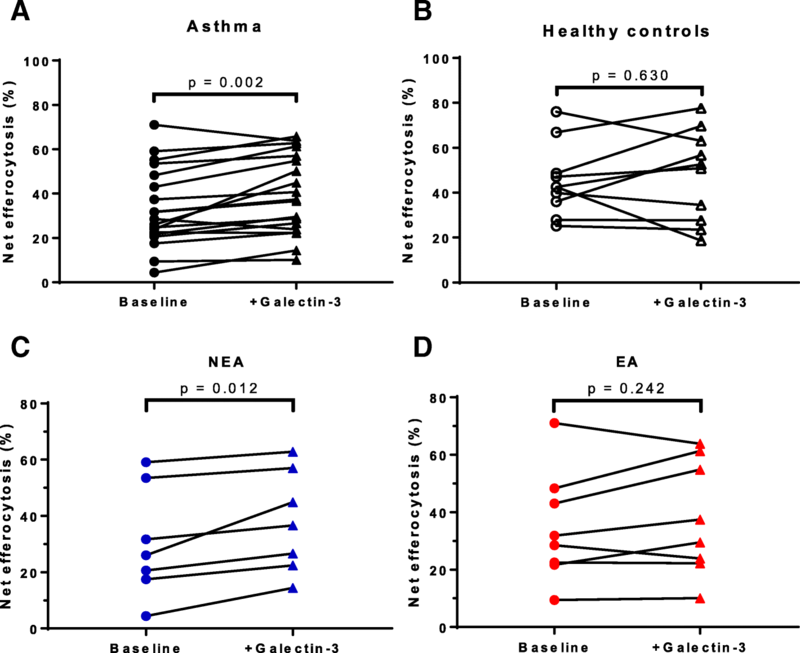 Galectin-3 modulates macrophage function in asthma, indicating a potential role for galectin-3 to reverse impaired efferocytosis in NEA. Asthma is a heterogeneous condition characterised by excessive inflammatory cell infiltration of the airways and airway hyperresponsiveness . About 50% of people with asthma have normal proportions of sputum eosinophils, termed non-eosinophilic asthma (NEA) [2, 3]. This phenotype of patients has also been found to have a defect in airway macrophage (AM) efferocytosis, defined as the engulfment of apoptotic host cells by phagocytes . Defective efferocytosis can lead to accumulation of dead cells in the airways, which can undergo secondary necrosis and degranulation, worsening the inflammation and symptoms [5–7]. Efforts to improve macrophage efferocytosis may provide a more targeted approach to regulate inflammation in NEA. Galectin-3 is a 32 kDa β-galactoside binding lectin secreted by macrophages and is known to play a role in the regulation of efferocytosis [8–10]. In a mouse model of asthma, the absence of galectin-3 was associated with a decreased clearance of apoptotic cells and persistence of inflammation [8, 11]. In humans, galectin-3 levels have been reported to be lower in asthma, particularly in neutrophilic asthma compared with eosinophilic and paucigranulocytic asthma , suggesting that failed efferocytosis may be occurring as a result of a galectin-3 deficiency in the airways. Exogenous galectin-3 can enhance efferocytosis of apoptotic cells by monocyte-derived macrophages (MDMs)  as well as by AMs in patients with chronic obstructive pulmonary disease (COPD)  which highlights the potential of galectin-3 in the regulation of macrophage function in NEA. This study characterised MDM efferocytosis in asthma and examined the effect of galectin-3 on this process. We hypothesised that MDMs from participants with asthma, particularly those with NEA would show reduced efferocytosis compared with healthy controls and that this defect would be reversed with the addition of exogenous galectin-3. 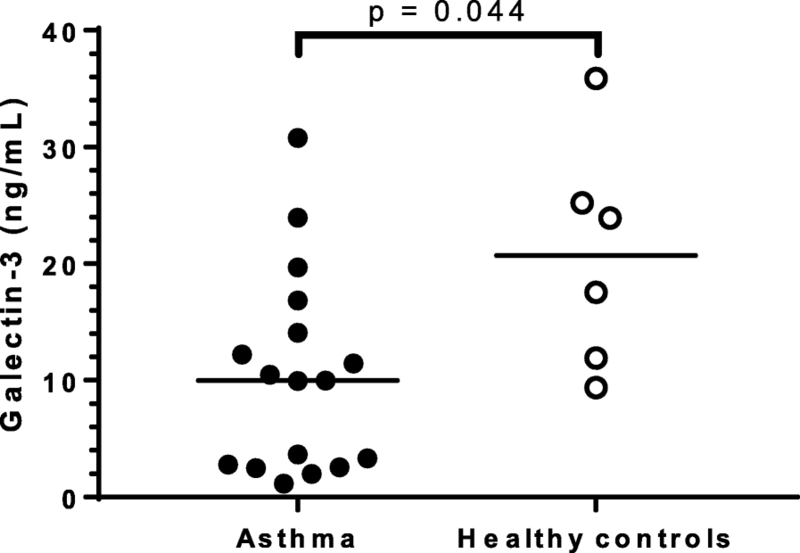 Efferocytosis was assessed in blood MDMs derived from participants with stable asthma (n = 19) and healthy controls (n = 10). Participants with asthma had a confirmed doctor’s diagnosis of asthma with evidence of variable airflow obstruction such as airway hyper-responsiveness, bronchodilator response (improvement of 12% and 200 mL following a short acting bronchodilator) or diurnal variation of peak expiratory flow . Participants who had experienced an asthma exacerbation or a change in asthma medications in the four weeks prior to the visit were ineligible for this study. The participants underwent a clinical assessment, which included the asthma control questionnaire 6 (ACQ6) , history of smoking, respiratory symptoms, skin prick allergy testing, sputum and blood collection. Ethics approval was granted by the Hunter New England Human Research Ethics Committee (Approval number: 15/12/16/4.01) and the University of Newcastle Ethics Committee (Approval number: H-2016-0114) and written informed consent was obtained. Participants were excluded if their post-bronchodilator forced expiratory volume in one second (FEV1) was less than 40% predicted as a safety precaution or if they were currently smoking or had ceased smoking in the last twelve months to limit confounders. Ex-smokers with a smoking history of more than 10 pack years combined with an exhaled carbon monoxide > 10 ppm (ppm) were excluded. Spirometry and sputum induction were performed as described previously . Briefly, a fixed sputum induction time of 15 min with hypertonic saline (4.5%) was used for all participants. The sputum sample was then dispersed using dithiothreitol for a total cell and viability count . May-Grunwald Giemsa-stained cytospin slides were also prepared and a differential cell count of 400 non-squamous cells was performed to identify the asthma sputum phenotype. Participants with ≥3% eosinophils were classified as eosinophilic asthma (EA) and those under 3% were considered as NEA . Peripheral blood mononuclear cells (PBMCs) were isolated from whole blood by density gradient centrifugation using Percoll gradients and resuspended in RPMI (GE Healthcare, Parramatta, NSW, Australia) supplemented with 10% (v/v) foetal bovine serum (FBS; Bovogen Biologicals, Keilor East, VIC, Australia), 1% (v/v) streptomycin (Thermo Fisher Scientific, North Ryde, NSW, Australia), 2 mM L-glutamine (Thermo Fisher Scientific), 20 mM HEPES (GE Healthcare) at 4 × 106 cells/mL. PBMCs were dispensed in a 24-well plate at 2 × 106 cells/well and incubated for 2 h at 37 °C to allow the monocytes to adhere. The wells were washed three times with pre-warmed phosphate buffered saline (PBS) and the monocytes differentiated into MDMs over 12 days in culture media supplemented with 2 ng/mL granulocyte macrophage-colony stimulating factor (GM-CSF) (Sigma-Aldrich, Castle Hill, NSW, Australia) as described previously . The media was replaced every 3 to 4 days. MDM culture supernatant was collected prior to the efferocytosis assay and stored at − 80 °C. Galectin-3 levels were measured in MDM culture supernatant by ELISA (R&D Systems, Minneapolis, MS, USA) according to the manufacturer’s instructions. Galectin-3 expression and localisation in MDMs was also assessed by immunocytochemistry as described previously . Following aspiration of the supernatant, 500 μL Accutase cell dissociation reagent (Thermo Fisher Scientific) was added to each well and incubated at 37 °C for 15 min to detach the MDMs. The cells were then transferred to cytospin slides, fixed in Paraformaldehyde/Lysine/Periodate (PLP) fixative (Sigma-Aldrich) as described previously  and coated in 15% (w/v) sucrose to protect them prior to storage at − 20 °C. The slides were thawed and the cells permeabilised with 0.1% Triton-X (Sigma-Aldrich) in phosphate buffered saline, blocked and immunostained with anti-galectin-3-Phycoerythrin (PE) (Biolegend, San Diego, California, USA) and primary anti-LAMP-1 antibody (US Developmental Studies Hybridoma Bank at the University of Iowa, Iowa City, USA) followed by secondary Alexa Fluor 488 anti-mouse antibody (Cell Signaling Technologies, Danvers, Massachusetts, USA). A PE-conjugated isotype control antibody (Biolegend) and an additional PE-conjugated galectin-3 antibody (BD Biosciences, North Ryde, NSW, Australia) were also included to rule out non-specific binding. The cells were mounted with ProLong Gold Antifade Mountant with 4′,6-diamidino-2-phenylindole (DAPI) (Thermo Fisher Scientific). Slides were observed on an Axio Imager.M2 epifluorescence microscope (ZEISS, Macquarie Park, NSW, Australia) under fluorescent optics and images were taken using an Axiocam 506 mono camera (ZEISS). The concentration of IL-1β, IL-6, IL-8, IL-10, IL-17A, IL-17F, IFN-ɣ and TNF was measured in MDM supernatant using a CBA Flex Set from BD Biosciences. Standard curves were reconstituted according to the manufacturer’s instructions. The samples were used neat and the assay was performed in Titertube Micro Test Tubes (Bio-Rad, Gladesville, NSW, Australia). All incubation steps were performed at room temperature and away from light. Capture beads (50 μL) were added to each titertube and incubated for one hour. PE detection reagent (50 μL) was then added to each titertube, mixed and incubated for 2 h. The beads were washed and resuspended in 300 μL of Wash Buffer. The tubes were vortexed briefly and loaded on a 96-well plate (Greiner Bio One, Kremsmünster, Austria) using a Viaflo II multichannel electronic pipette (Integra Biosciences, Zizers, Switzerland). The 96-well plate was then loaded in a FACS Canto II flow cytometer and a total of 300 events per target was recorded per well. The data was analysed using the FCAP array software version 3.0 (BD Biosciences). Granulocytes were isolated from whole blood of healthy volunteers by density gradient centrifugation using Percoll and labelled with 2.5 μM PKH26 (Sigma-Aldrich) as described previously . The labelling reaction was stopped after 5 min by the addition of FBS and the cells washed twice with PBS. The granulocytes were resuspended at 1 × 106 cells/mL in RPMI supplemented with 1% (v/v) FBS and 1% (v/v) penicillin/streptomycin and cultured for at least 20 h to induce apoptosis. This was found to result in > 80% apoptotic cells measured using the FITC Annexin V apoptosis detection kit from BD Biosciences. Adherent MDMs were pre-incubated with 50 μg/mL galectin-3 (kindly donated by Professor Anna Karlsson, University of Gothenburg, Sweden) (or media) in complete media for 10 min at 37 °C prior to efferocytosis . Apoptotic granulocytes were co-cultured with MDMs at a ratio of 5:1 for 90 min at 37 °C . The MDMs were then washed thrice with 500 μL PBS to remove unbound granulocytes and detached using Accutase as described earlier. The cells were transferred to FACS tubes and efferocytosis was measured by flow cytometry (FACS Canto II, BD Biosciences). A total of 10,000 macrophages were recorded based on forward and side scatter characteristics and the median fluorescence intensity (MFI) was also recorded. The efferocytosis assay was also performed in the presence of 5 μg/mL cytochalasin D (including a 30 min pre-incubation step) to control for surface-bound but non-internalised granulocytes . Data was analysed using FACSDiva version 8 and net efferocytosis was reported as the difference in the percentage of PKH26-positive MDMs in the presence and absence of cytochalasin D.
All results are expressed as mean ± SD or median (q1, q3) unless otherwise indicated. The unpaired t test (parametric data) and Mann-Whitney U test (non-parametric data) were used for comparisons between unpaired samples and the paired t test used for paired data. The two-sample t-test of proportion was used to compare proportions and the Spearman rank correlation was used to identify associations between data. All statistical analyses were performed using GraphPad Prism software version 7.02 (GraphPad Inc., La Jolla, CA, USA) and Stata version 13.1 (Stata Corporation, College Station, TX, USA). A p-value < 0.05 was deemed statistically significant. The participants with asthma were matched for age but had a higher BMI compared with the healthy controls (Table 1). The participants’ gender, smoking history and atopy did not differ between the asthma and healthy controls. The majority (79%; n = 15) of participants with asthma were taking ICS with a median daily dose of 1000 μg. The majority (68%; n = 13) of participants had moderate to severe asthma and were GINA step 4, while the rest were classified as GINA step 1 (21%; n = 4) and 3 (11%; n = 2). The EA and NEA participants were of similar age, gender and BMI (Table 2). They were taking a similar dose of ICS and did not differ in their lung function. The sputum total cell count and viability was similar between the EA and NEA phenotypes (Table 3). Participants with EA had the highest proportion and number of eosinophils as expected but similar macrophage, neutrophil and lymphocyte proportions. MDM net efferocytosis was measured at baseline and was found to be lower in the asthma cohort (33.2 (±17.7)%) compared with the healthy controls (45.3 (±15.9)%) although the difference did not reach statistical significance (p = 0.081) (Fig. 1). Net efferocytosis MFI was used to estimate the relative number of engulfed granulocytes per MDM and was also observed to be lower in participants with asthma (55 (26, 352)) compared with the healthy cohort (204 (150, 488)) but did not reach statistical significance (p = 0.064). Net efferocytosis was not associated with any of the clinical outcomes measured such as age, BMI, lung function, ACQ6 score and ICS dose [see Additional file 1]. When examined by asthma phenotype, net efferocytosis did not differ between the EA (31.4 (±19.2)%) and NEA phenotypes (28.7 (±21.5)%; p = 0.748). Net efferocytosis was similar between the NEA (28.7 (±21.5)%) and healthy controls (45.3 (±15.9)%; p = 0.105). The net efferocytosis MFI was also similar between the EA (78 (32, 352)) and NEA phenotypes (55 (26, 832); p = 0.809). Net efferocytosis MFI was lower in NEA (55 (26, 832)) compared with the healthy controls (204 (150, 488)) but did not reach statistical significance (p = 0.088). A concentration of 50 μg/mL galectin-3 used in this study was similar to levels reported at inflammatory sites [11, 22]. Addition of exogenous galectin-3 significantly improved net efferocytosis (39.6 (±17.8)%) compared with untreated MDMs (baseline: 33.2 (±17.7)%; p = 0.002) in the cohort with asthma (Fig. 2a). This represented a 19% increase from baseline. Galectin-3 had no effect on MDM net efferocytosis (47.5 (±20.4)%) compared with untreated cells (baseline: 45.3 (±15.9)%; p = 0.630) in the healthy controls (Fig. 2b). Net efferocytosis MFI was more than fourfold higher upon addition of galectin-3 (227 (46, 918)) which was statistically significant compared with untreated MDMs (baseline: 55 (26, 352); p < 0.001) in the asthma cohort. Net efferocytosis MFI was twofold higher in the galectin-3-treated group (526 (39, 1098)) compared with the untreated MDMs (baseline: 205 (150, 488)) in the healthy cohort but did not reach statistical significance (p = 0.275). Galectin-3 significantly improved net efferocytosis (37.8 (±18.1)%) compared with untreated MDMs (baseline: 30.4 (±19.7)%; p = 0.012) in participants with NEA (Fig. 2c). This represented a 24% increase in efferocytosis from baseline. No significant improvement in net efferocytosis was observed in the galectin-3-treated group (37.9 (±20.0)%) compared with untreated MDMs (baseline: 34.5 (±19.2)%; p = 0.242) in participants with EA (Fig. 2d). Addition of galectin-3 increased net efferocytosis MFI three-fold (151 (32, 660)) compared with the untreated MDMs (baseline: 47 (26, 764); p = 0.078) in the NEA cohort. In the EA cohort, galectin-3 treatment also improved net efferocytosis MFI three fold (291 (47, 928)) compared with the untreated MDM group (baseline: 75 (28, 314)) but did not reach statistical significance (p = 0.078). Net efferocytosis was not associated with any of the clinical outcomes measured. However, both net efferocytosis % and MFI following galectin-3 addition were negatively correlated with sputum macrophage numbers in participants with asthma (Spearman r = − 0.594; p = 0.042 and Spearman r = − 0.671; p = 0.017 respectively) (Fig. 3) [see Additional file 2]. Galectin-3 had a diffuse but uniform distribution in the cytoplasm and nucleus of most MDMs, however some cells appeared to have concentrated areas of galectin-3 staining visible under high magnification (× 1000) (Fig. 4a-b). A similar pattern was observed in MDMs when stained with another PE-conjugated galectin-3 antibody from a different manufacturer, confirming that the galectin-3 puncta were not an artefact of the staining process (Fig. 4c). A corresponding PE isotype antibody was also used to ascertain that the galectin-3 staining observed was specific and showed negligible staining in MDMs. The proportion of MDMs with galectin-3 punctae was similar between the asthma (4.8 (0.9, 6.7)%) and healthy cohorts (4.8 (0.2, 7.3)%; p = 0.845). The proportion of punctate MDMs was not associated with any of the clinical outcomes, efferocytosis or sputum cell counts. Galectin-3 has previously been reported to be associated with intracellular compartments such as phagolysosomes in macrophages . In order to determine the localisation of the galectin-3 puncta in MDMs, a galectin-3/LAMP-1 double indirect immunofluorescence staining was performed. LAMP-1 is an intracellular marker found on the lumenal side of lysosomes . Galectin-3 and LAMP-1 were found to be expressed in all MDMs and the punctate structures generally appeared yellow due to the superimposition of the red and green colour (Fig. 5). Galectin-3 levels were measured in MDM supernatant 12 days post cell isolation (and following 3–4 days of culture) prior to efferocytosis and were found to be significantly lower in asthma (9.99 (2.67, 15.48) ng/mL) compared with healthy controls (20.72 (11.28, 27.89) ng/mL; p = 0.044) (Fig. 6). There was no significant difference in MDM galectin-3 levels between the EA (3.63 (2.48, 14.09) ng/mL) and NEA participants (9.96 (2.56, 16.86) ng/mL; p = 1.000). About 40% of the participants with asthma secreted very little galectin-3 compared with the rest of the participants but were comprised of a mix of both EA and NEA participants. Galectin-3 secretion was positively associated with the number of MDMs per well (Spearman r = 0.533; p = 0.011) but was not associated with efferocytosis. The number of MDMs per well did not differ between the asthma (2.3 × 105 (±1.1 × 105) cells/well) and healthy controls (2.0 × 105 (±1.2 × 105) cells/well; p = 0.612). To account for the differences in MDM numbers per well, galectin-3 secretion was recalculated as the amount secreted per 105 cells and was still observed to be significantly lower in asthma (3.38 (1.74, 6.69) ng/mL/105 MDMs) compared with the healthy controls (11.06 (4.9, 14.06) ng/mL/105 MDMs; p = 0.031). There was no significant difference in galectin-3 secretion per 105 MDMs between the EA and NEA phenotypes. MDM secreted IL-6 and CXCL8 levels were similar between the asthma and healthy participants [IL-6 (asthma: 59.8 (27.6, 92.9) pg/mL and healthy participants: 45.2 (30.6, 569.9) pg/mL; p = 1.000) and CXCL8 (asthma: 4.37 (1.73, 10.44) ng/mL and healthy participants: 7.57 (1.88, 15.40) ng/L; p = 0.703)]. There were no statistically significant differences in IL-6 and CXCL8 levels between the asthma and healthy controls when recalculated per 105 MDMs. IL-6 and CXCL8 were not associated with efferocytosis (Spearman r = 0.113; p = 0.626 and Spearman r = 0.404; p = 0.107 respectively). IL-1β, IL-10, IL-17A, IFN-ɣ and TNF were undetectable in MDM supernatant. Previous studies have shown that AM efferocytosis is reduced in asthma, particularly non-eosinophilic asthma . In this study, we observed reduced MDM efferocytosis from participants with asthma and demonstrated that addition of galectin-3 could significantly improve efferocytosis in asthma but not in healthy MDMs. This finding suggests that efferocytosis may already be occurring at the maximal rate in healthy MDMs and cannot be further increased, or at least not to a detectable level using this assay. Galectin-3 has previously been reported to enhance MDM efferocytosis of apoptotic granulocytes in a concentration-dependent manner . In this study upon galectin-3 addition, MDM efferocytosis in participants with asthma was increased by almost 20% of baseline but did not reach baseline efferocytosis measured in the healthy controls. This provides further evidence of a macrophage defect observable at the systemic level in asthma [4, 21]. The cohort with asthma were mostly GINA 4 with persistent symptoms and more severe disease, which may influence inflammatory cell regulation, exemplified by a decrease in macrophage efferocytosis. Regulating macrophage function may be the key to regulating inflammation and the associated symptoms in asthma. In NEA, defective efferocytosis may lead to an accumulation of dead cells in the airways which may undergo secondary necrosis and release pro-inflammatory mediators and damage-associated molecular patterns [5, 24]. These molecules activate and recruit more inflammatory cells to the lungs that may in turn lead to persistent airway inflammation. In this study, there was no link between MDM efferocytosis and MDM IL-6 and CXCL8 secretion, while the remaining cytokines (IL-1β, IL-10, IL-17A, IFN-ɣ and TNF) were undetectable in MDM supernatant. However, a negative correlation between efferocytosis and sputum macrophage numbers was observed. This finding may suggest an increased recruitment, proliferation or survival of macrophages in the airways in response to decreased efferocytosis . A similar effect has been reported in COPD, whereby lung AM numbers were linked to the severity of the condition . It is possible that defective efferocytosis may lead to the generation of chemotactic or proliferative signals that promote macrophage migration to the airways. 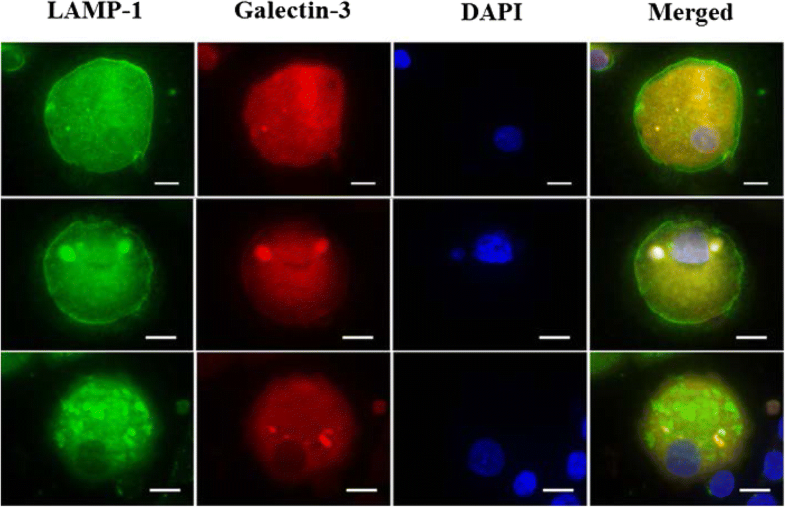 Galectin-3 has been reported to accumulate at different sites within cells such as phagosomes , damaged vesicles  and pathogen-containing vacuoles [27, 28]. 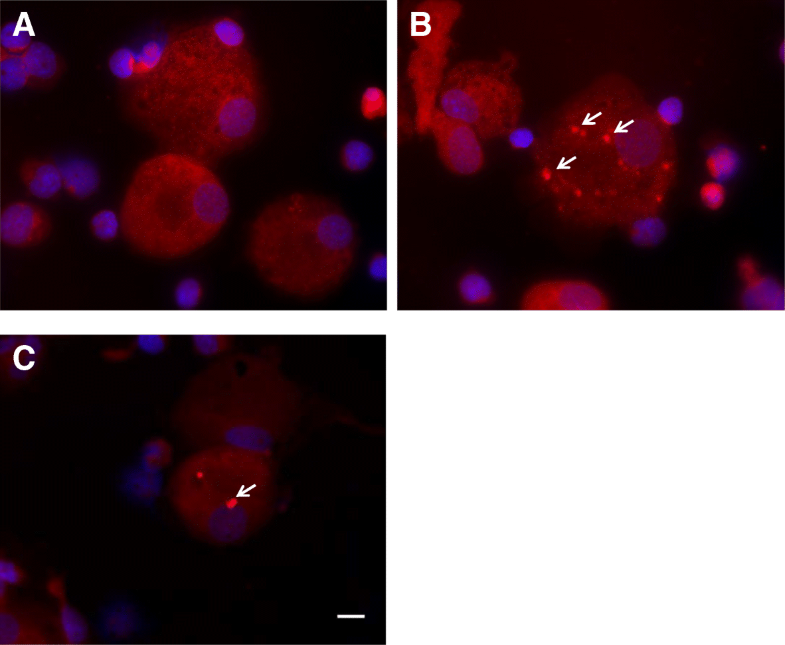 In this study, galectin-3 was diffusely distributed in the cytoplasm and nucleus of most MDMs which is in agreement with the localisation previously reported in macrophages [8, 29, 30]. Galectin-3 is known to shuttle between the nucleus and cytoplasm depending on the cell type and culture conditions . In this study, approximately 5% of MDMs also exhibited galectin-3 punctae which did not differ between the groups, indicating that galectin-3 trafficking may be occurring at a normal rate in asthma. The proportion of MDMs with punctae was not associated with efferocytosis which makes it difficult to predict the effect of galectin-3 punctae on this process, if any. The galectin-3 punctae also tended to co-localise with LAMP-1 in MDMs which agrees with previous studies that suggest that it may be localised to phagolysosomes . Further investigations using confocal microscopy might help pinpoint the exact location of galectin-3 punctae in macrophages and its dynamic movement within the cell. Reduced levels of galectin-3 in sputum have been reported in asthma and are thought to contribute to persistence of airway inflammation through decreased macrophage efferocytosis [4, 12]. In this study, galectin-3 secretion by MDMs was lower in participants with asthma compared with healthy participants, while IL-6 and CXCL8 secretion was similar between the groups. These findings suggest that although galectin-3 trafficking in MDMs from participants with asthma is occurring at rate similar to healthy controls, the amount secreted is significantly less which may affect the function of the cells exemplified in this case as decreased efferocytosis in asthma. A limitation of this study is the high BMI of the participants with asthma which may have an effect on immunological processes on the body. In fact, a higher BMI is generally associated with a more pro-inflammatory immune response such as increased TNF-α and IL-6 expression [32–34], which may influence galectin-3 expression in macrophages . Future studies could be expanded to a larger cohort of BMI-matched participants to ensure the differences observed are driven purely by the disease state. In conclusion, this study reported no difference between MDM efferocytosis of apoptotic granulocytes in adults with asthma and healthy controls but showed that it can be increased in asthma, particularly in NEA through the addition of exogenous galectin-3. These findings indicate that galectin-3 may play a role in macrophage efferocytosis and may provide an indirect way of modulating inflammation in asthma. Kellie Fakes, Lakshitha Gunawardhana, Heather MacDonald, Joanne Howes, Jenny Darcy, Catherine Delahunty, Stephany Sanchez, Michael Ramsahai, Nicole Cole, Jessica Tilman, Kylie Belchamber and Jonas Elmwall as well as all the study participants. This work was supported by an Australian National Health and Medical Research Council project grant and a University of Newcastle International Postgraduate Research Scholarship. ME, JLS participated in the design of the study, compiled, analysed and interpreted the data and drafted the manuscript. JLS, MF, KP reviewed the drafted manuscript and were responsible for the supervision of the project. KJB assisted in the design of the study and reviewed the final manuscript. LED assisted with the establishment of a method to measure efferocytosis and reviewed the final manuscript. JB, AK provided the galectin-3 used in this study and reviewed the final manuscript. All authors read and approved the final manuscript. Ethics approval was granted from the Hunter New England Human Research Ethics Committee (Approval number: 15/12/16/4.01) and the University of Newcastle Ethics Committee (Approval number: H-2016-0114) and written informed consent was obtained for each volunteer recruited for the study.